The book deals with engineering aspects of the two emerging and intertwined fields of synthetic and systems biology. Both fields hold promise to revolutionize the way molecular biology research is done, the way today's drug discovery works and the way bio-engineering is done. Both fields stress the importance of building and characterizing small bio-molecular networks in order to synthesize incrementally and understand large complex networks inside living cells. Reminiscent of computer-aided design (CAD) of electronic circuits, abstraction is believed to be the key concept to achieve this goal. It allows hiding the overwhelming complexity of cellular processes by encapsulating network parts into abstract modules. 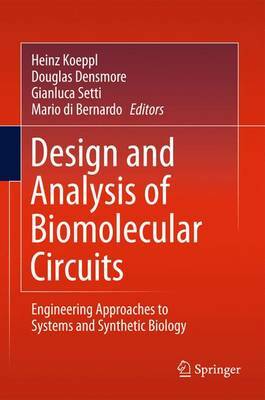 This book provides a unique perspective on how concepts and methods from CAD of electronic circuits can be leveraged to overcome complexity barrier perceived in synthetic and systems biology.